Well we know what we are playing in this household tonight! And what a fantastic way for students (or anyone with an interest) to engage with a specific period of history, written by the women themselves who took part in it. Board game enthusiasts, this one is for you! Image from the Museum of Applied Arts and Sciences, Australia. Close-up of the design on the crockery. In London, the leading suffrage campaign organisation was the Women’s Social and Political Union, which had been founded in 1903 by Emmeline Pankhurst. The WSPU excelled at what we would today call ‘branding’. Everything they did was accented by their chosen shades of cream, purple, and green, right down to the dresses their supporters wore. A natural step after this was to create their own line of gifts or souvenirs. Money was always tight, and it was expensive to run a national campaign against the government. Funds could be raised with items that also promoted the cause. 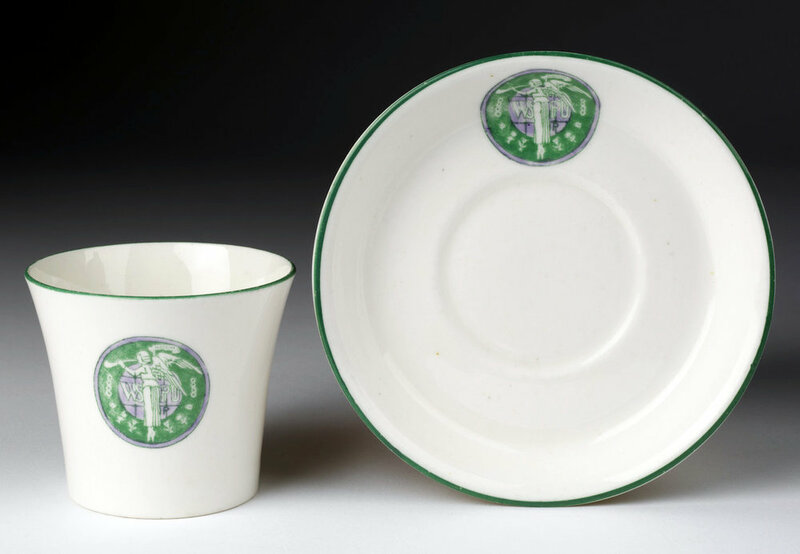 To this end, it became possible to purchase WSPU-branded tea sets, condiments like jam or marmalade, notebooks, cigarettes, or soap for example. All of these were emblazoned with slogans like ‘Votes for Women’, and wore the cream, purple, and green. Any surviving are great collectors’ items now! Image from Google Arts and Culture, via the Museum of Australian Democracy. Which leads us to Pank-a-Squith! The ‘Pank’ is after Emmeline Pankhurst, and the ‘Squith’ is after Herbert Asquith, the prime minister at the time and opponent of women’s suffrage. This board game was professionally manufactured in Germany, and sold wherever WSPU merchandise was sold in Britain, such as in suffrage tea rooms or supporting shops. Like the other items, it came emblazoned in the appropriate colours and branding. It also, absolutely ingeniously, helped explain the work that the suffragette had to put in in order to protest government policy. The game came with six determined-looking little suffragette figures, with their hands on their hips. You picked one, and rolled a die. The aim of the game is to move from the first square, where a woman is in her home with a child, to the last square, which is the Houses of Parliament. Along the way, the obstacles that move the woman forward or back related to actual historical events, such as police brutality, window-smashing, or spells in prison. An advertisement for the IWFL Tea Rooms on Westmoreland St in Dublin, from Smashing Times by Rosemary Cullen Owens. Apologies for the shaky phone pic! 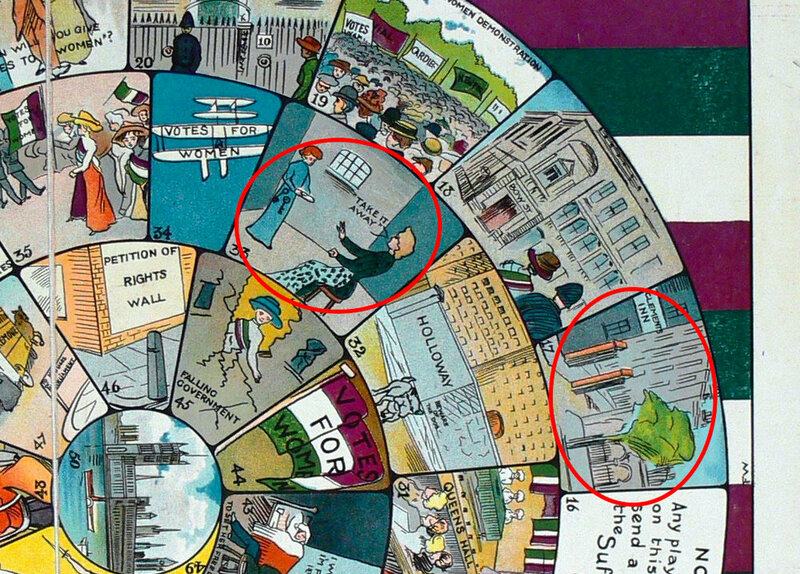 Many Irish suffragettes, or suffrage campaigners working in the Irish context, would have related to this board game and played it with wry enjoyment. A number of Irish women had travelled to London to learn campaign tactics there, and spent time in English prisons due to suffragette activity. The situation was different in Dublin though. The Irish equivalent organisation, the Irish Women’s Franchise League, which had been founded in 1908 (just one year before this board game was released) did not participate in colour branding, and did not sell gifts or souvenirs to raise funds. They did run tea rooms, as you can see from the poster above, and perhaps Pank-a-Squith was played on Westmorland Street! However, some of the stops on the game would have been very familiar to them. Because they did not have permanent London addresses, Irish suffragettes often gave 4 Clement's Inn as their address in court and prison records. This was the address of the WSPU headquarters, and is square 17 on the game. Hunger-striking, a prison protest undertaken on both sides of the Irish Sea, is depicted in square 33. Both of these are circled in the image above. Perhaps Irish women imagined what the game would look like if it were really about the Irish context, since it was such a different experience to that of the English, in so many ways. Obstacles might have included members of the Irish Party, who consistently voted against the inclusion of female suffrage in Home Rule bills. There may have been a square for Cumann na mBan, which diverted the energies of many patriotic women into fundraising for an organisation that they were barred from joining. 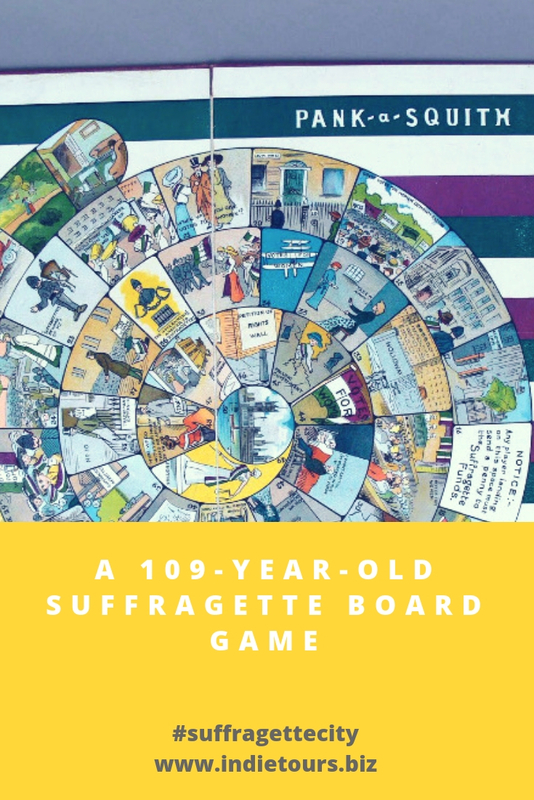 Although the Great War came after the production of this game, it would also have undoubtedly held a few squares of its own, since its development was responsible for the cessation of protest activities from all but a handful of suffrage campaigns. Perhaps there is an appetite out there for the production of a similar game based on the history of the suffragettes of Dublin! Let us know what you think in the comments. And in the meantime, don’t forget that very soon you will be able to walk around the streets of Dublin yourself (hand on hip if you fancy it!) and navigate the rise of the Irish suffrage campaign at the turn of the twentieth century, and the eventual granting of universal suffrage in the Free State constitution in 1922. Sign up using the form below to stay in the loop about that! Chapman, Jane. ‘The argument of the broken pane’ in Media History (21: 3, 2015). Description of a copy held in the Museum of Australian Democracy. Interested in the Upcoming Audioguide? It’s called ‘Suffragette City’, it’s about the campaign in Dublin City, and it’s going to be amazing! Sign up for news alerts about it below.